During our interpretive period of the Madisons’ retirement era, John Payne Todd, Dolley Madison’s son from her first marriage, maintained a bedchamber at Montpelier. Previously referred to as “the small bedchamber,” this space has now been furnished and interpreted as Payne’s bedroom and has been opened to visitors since January 2018. With a wealth of research provided by former Director of Museum Programs, Meg Kennedy, former curator Teresa Teixeira utilized a range of source material to assist her in devising his bedchamber. “Furnishing a Bedchamber: Wallpaper & Textiles” delves into the research and physical evidence gathered to accurately interpret the space. To read how furniture, objects, and props were chosen for John Payne Todd’s room, visit our Project Page, Furnishing the room of John Payne Todd. In 2007, Dr. Susan Buck, a conservator specializing in painted surfaces and architectural materials, investigated the small bedchamber at Montpelier. There she uncovered tiny fragments of wallpaper on the surbase reveals of the sides of the room’s mantel pilasters. The paper was painted directly with a thin matte blue-green paint (preserved by layers of modern white paint). Microscopy analysis confirmed that the paper was rag-based with flax fibers and the paint contained Prussian blue pigment, consistent with early nineteenth century papers. The fragment size was insufficient to determine if the paper was painted a solid color or patterned, or if it was imported. The context of the fragment and the accumulation of later paints on top of it suggest it may be a Madison-era paper (and may relate to a blue-green fragment found in a rodents’ nest in the partition between the small bedchamber and the neighboring large bedchamber). Because of the significance of the discovery, the walls in this room were left bare for future papering. A sectional close up of the Bees & Stars wallpaper in Dolley Madison's son's room, John Payne Todd. “Bees and Stars” is an example of a harlequin pattern that creates a bold, geometric look using an inverse white with black design. The pattern dates from the early 19th century when such geometric styles were very popular in France. Additionally, bees were used as a symbol of Napoleon and six-pointed stars as a symbol of his empire. The Madisons had several figures and images of Napoleon on display throughout the House, presumably largely purchased by Payne Todd while in Europe. The figures included Napoleon crossing the Alps (after the famous David portrait) in alabaster, Napoleon in exile at Alba along with a figure of Icarus, a copy of Houdon’s bust of Napoleon, a small bronze figure, and a bronze figure of Louis XVIII with Napoleon inside. 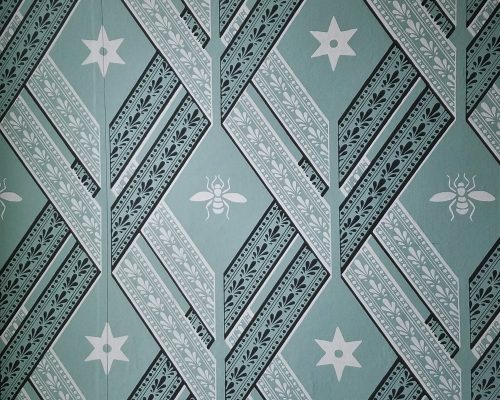 The Curatorial & Collections Department worked with Adelphi Paper Hangings who create handmade, historic and custom wallpapers, including the Bees and Stars pattern. The reproduction bedhangings created for this room are based on physical evidence found in a rat’s nest within the room’s wall. The silk fragment, seen below, has a plain weave with golden-colored warps and red wefts. Taffetas that are woven in the manner are today called “shot silks” and were called “changeable silks” during the period. Because of the two colors and the even weave, the fabric appears to change colors as it drapes and as light changes. The technique was very popular for clothing throughout the eighteenth century and upholstery to a lesser extent through the nineteenth century. Green was chosen for a lining color based on comparable documentation and extant samples from other collections. Early 19th-century bedhanging design by Thomas Sheraton (L) and reproduction bedhangings in Payne Todd’s room (R). Like the bedhangings, a sample of woven grass carpeting, seen below, was found during the 2008 restoration. The floorboards in the small bedchamber closest to the passage were compromised by the addition of a stair partition in ca. 1865, and restoration-era boards were installed. However, the remaining ca. 1797 floorboards have some pre-1860s evidence of tacking/stapling at 36″ intervals, which may date to the Carson era of ownership. The tacking evidence, the woven grass fragment and the popularity of grass matting in the 18th century led to the decision to include a grass mat on the bedchamber floor. A fragment of grass matting found inside a rodent’s nest during the Restoration Project. A textile fragment discovered in a rodent’s nest during the Restoration Project. Grass matting fragment found in the room’s wall (L) and a silk fragment found in a rat’s nest in the wall during the 2008 restoration (R). The grass carpeting, or grass matting as it was also called, found in the wall is one of the largest extant pieces known from this period. Unlike today’s grass carpeting, the grass matting of the eighteenth and early nineteenth centuries was made of the whole straw rather than the retted fibers. Grass matting gained popularity throughout the eighteenth century both because of its exoticism and its coolness in summer. It was often taken up during the winter and replaced with a textile carpet. Detail of the fragment of grass matting found inside a rodent’s nest during the Restoration Project. Detail of the grass matting fragment found (L) and detail of the reproduction grass matting now installed in the room (R). The grass carpet we have installed is not an exact replica of the fragment found in the wall for practical reasons: other museums who have installed exact replicas of period grass matting have found it does not stand up to visitor traffic. Thus, ours is noticeably thicker than the period matting in order to allow guests into the space. Additionally, both the straw and fiber portions of the plant have been twisted together for strength and durability, and we have chosen a more durable weave structure. However, the grass carpeting does utilize the same material and offers the same appearance as known, period mats. Dr. Susan Buck, “Cross-section Paint Microscopy Report: James Madison’s Montpelier Interior Paint Study,” July 2007. See Section 26, M-200, pp. 365-375. Memo from Susan Buck to Gardiner Hallock, April 18, 2008, RE: Two wallpaper questions prior to RAC meeting. Francoise Teynac, Pierre Nolot, and Jean-Denis Vivien, Wallpaper a history (NewYork: Rizzoli International Publications, Inc, 1982), 125. “Bees and Stars.” Adelphi Custom and Historic Wallpaper and Paper Hangings, 2015, www.adelphipaperhangings.com/bees.html. Edward Caffarena to James Madison, July 25, 1816, James Madison Papers, Library of Congress, Washington, DC. MRD-S 16238. The inclusion of Icarus has a double meaning: it ties Napoleon to the hubris of the mythological character, and Icarus was the name of the ship that carried him into exile. John H. B. Latrobe to Charles Carroll Harper, August 3, 1832, box 4, John H. B. Latrobe Family Papers, MS 523, Maryland Historical Society, Baltimore, Maryland. MRD-S 123. List of items bought at Toddsberth sale, E. Rowe [Elhanon Row], November 11, 1852, box Causten Family: A through Causten, James—Notebook, folder Causten, James H. Jr.—Financial documents (accounts, bills, receipts), Dolley Madison Collection, MS 47, Greensboro Historical Museum, Greensboro, North Carolina. MRD-S 32274. Mary Carvallo Causten Kunkel, Manuscript notes created in preparation for the 1899 Kunkel Sale, ca. 1899 (with later notes in unknown hand), box Madison/Causten/Kunkel: Estate Related Papers, folder Catalogs—Mss.—Madison Estate (Keyed to 1899 catalog), Dolley Madison Collection, MS 47, Greensboro Historical Museum, Greensboro, North Carolina. MRD-S 23381. John H. B. Latrobe to Charles Carroll Harper, August 3, 1832, box 4, John H. B. Latrobe Family Papers, MS 523, Maryland Historical Society, Baltimore, Maryland. MRD-S 123.